My niece is turning six this month. What a great year! It’s full of surprise, too. When I was six, I realized that I was going to keep getting older, forever. At the time, that was a good thing. I also figured out that I would never have an older brother. That made me sad. When I was six, my front teeth were too big for my mouth. They still are, kind of. I have bunny teeth and shark mouth, which is an odd combination. My sister and mom were my best friends. Again, still true. On vacations, we went to Texas to visit my grandparents. I played with my cousins, and one of them had a go-cart. We would vroom up and down the alley, and then later pile into the bed of my uncle’s truck – we don’t need no stinkin’ seat belts! – and go to 7-11 to get a Slurpee, which was something my mom wouldn’t let me have at home. One time on the go-cart we drove into a passing wasp, who stung me right under my eye. Once I got heat stroke from riding around in the back of the truck in the 1,000 degree (farenheit) Texas heat. 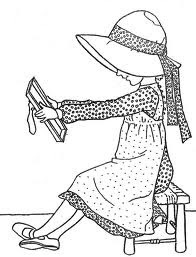 Reading, wRiting & aRithmetic , and it was taught to the tune of a hickory stick, they could spank you if you were bad. I never got spanked. Others did. I went to school with my older brother and lots of cousins and everyone in the neighborhood went to the same school. I had crazy curly red hair and my mother made all my school clothes. She sewed all summer for my wardrobe. It was not extensive or creative. It was functional. My Mom starched my petticoats (until they cut your naked legs) on the weekends and hung them out on the clothes lines to dry. My brother had stretchers that they put in his jeans to make a crease. Laundry had its own life! I had skinny feet and needed good shoes (my father didn’t enjoy that!). We got ONE pair per year. Period. I had lots of playmates and we played after school and after dinner until dark. No homework until you were older. Maybe the 3rd grade and not much at that. I loved my box of Crayola’s and never pealed the paper off or broke them. I was so happy when I moved up to 16 from 8 colors. My favorite color was Burnt Sienna and that was a big step on the color wheel. We did not have TV or even a clue about TV. We listened to the radio. We took naps. We read books. We wrote in tablets so our handwriting improved. I had the chicken-pox and nearly clawed my skin off. And Measles also. No shots for us. Just endure and survive. We had the first Polio vaccine and we took it in sugar lumps. Yummy, but very edgy. We had only little white children in our schools, and celebrated Christian holidays only. I bit my nails. I had bird legs and looked like a stick figure. It was all part of a journey that we all took together. I still have lunch and talk to those kids that were with me in Miss West’s first grade class at James B. Bonham. We are still on that journey that began at age 6. It was a great adventure, and amazingly enough it started 60 years ago! I had a Miss West, too. I loved her. She let me choose my spelling words right out of the dictionary. I’d like to give my niece an illustrated booklet of people’s six year old memories. I think that would be a cool gift. What do you remember about six? 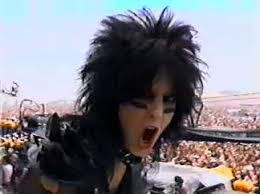 This is Nikki Sixx. He has nothing to do with this post, but this is what he looks like when he shouts at the devil. This entry was posted in Uncategorized and tagged six years old by avr. Bookmark the permalink. When I was six, I lived in a small Victorian house in California. It was surrounded with thick ivy and I still have nightmares about creatures living in it, grabbing my toys and pulling them underground. I had a playroom with Holly Hobby plates hung on the wall. My favorite was the one where Holly was pouring a kitten milk. In my bedroom, I had orange, brown, and white kitten wallpaper. It bothered me that there weren't any other colors in the wallpaper, so I spent a day coloring it in with rainbow colored markers. So yes, I was obsessed with cats. I couldn't help it– they followed me home. I made all my dolls into cats too by taping construction paper ears to their heads and drawing whiskers on them with black sharpie.